Pwn20wnd’s unc0ver jailbreak tool has enjoyed a monopoly over iOS 12.0-12.1.2 for months, albeit with limited handset support due to the lack of Cydia Substrate support for A12(X) devices. On the other hand, that could all change in the very near future. 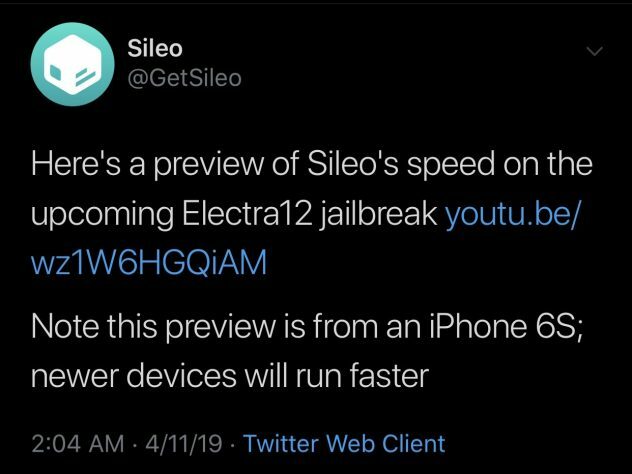 The Sileo Team on Thursday Tweeted a teaser of what appears to be the Sileo app running on the upcoming Electra12 jailbreak, citing it to be a speed demonstration of the Cydia alternative for package management on jailbroken handsets. If you thought that was zippy, then Sileo team noted that newer devices would be much faster. Unfortunately, we don’t have any comparisons to go by at this time. Reading between the lines in this Tweet presents us with one of the very first obvious clues that Electra will soon be updated with support for iOS 12. The new tool, dubbed Electra12, has been under development for some time, although the Electra Team has been somewhat quiet about their progress. It’s not clear at this time what firmware versions Electra12 will support, but based on today’s current exploit selection, we can only assume it will work with iOS 12.0-12.1.2 much like unc0ver. Perhaps the most significant difference between unc0ver and Electra is that the latter now installs Sileo and Substitute by default (Cydia can still be used alongside Sileo). Unc0ver users are currently waiting for Saurik to update Cydia Substrate for A12(X) devices, but with Electra12 facilitating an alternative to Cydia Substrate, it’s possible that the tool could support A12(X) devices out of the box. This is just speculation, however, and there’s still plenty of wiggle room for interpretation from now until release.